The Hédène gift box, made in France, covers 250g monofloral honeys with fineness and delicacy. The Hédène gift box is perfect for a present or for treating yourself. It suits only 250g jars. The Hédène gift box covers your French honeys, for a greedy gift ever chic and elegant. This Parisian style gift box, sober and refined, embellishes 250g jars and makes them the perfect gift for fines gourmets looking for elegant products. Thanks to this refined profile box, your monofloral Hédène honeys will be enhanced. 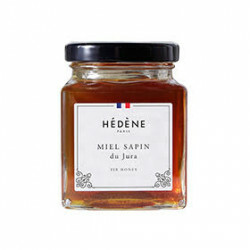 With Hédène honeys, share the emotion of a unique gustatory pleasure. The exceptional quality of Hédène French monofloral honeys comes from the wealthy French floral heritage, a sustainable beekeeping and a traditional know-how. With their unique taste, color and texture, Hédène honeys will make you live an unforgettable savoring moment.